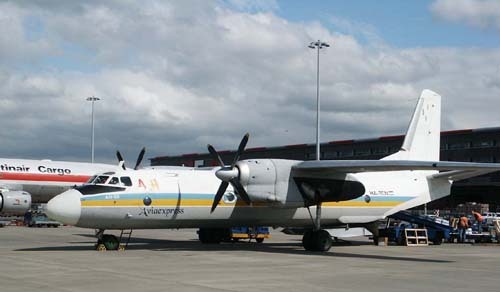 Antonov An-26 HA-TCN (cn7705) seems to be the only aircraft presently operated by Aviaexpress of Budapest,Hungary (22Aug02). It's seen here being loaded with one-day-old chickens at Schiphol's Sierra ramp; a Martinair MD-11F is seen in the background, on "homeplate". An-26 RA-26644 is getting some handling attention here at the R-ramp: the fueltruck just pulled up and a conveyor belt sees the loading is progressing nicely. I took this one in may or june 1998. The An-26 is a versatile transporter, widely in use in civil aviation but also a workhorse for many air forces. The engines are two 2820hp Ivchenko AI-24T turboprops, which give it a range of some 1300 kms (800 mls) with a cruising speed 450 km/h (280 mph) at 3500m (11.500ft). 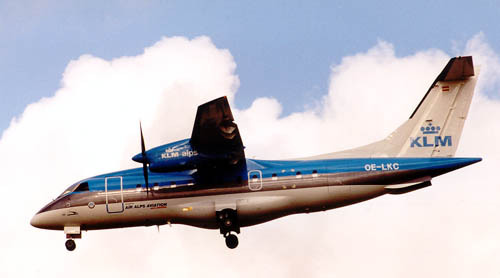 In 2001 suddenly a new operator appeared at Schiphol, with a classic aircraft no less ! West Air Sweden stationed a former Royal Air Force HS.748 (operating 10 of them !) at Amsterdam for nightly newspaper charters. A pleasant surprise indeed, which unfortunately did not last long as they were soon replaced by more modern aircraft. 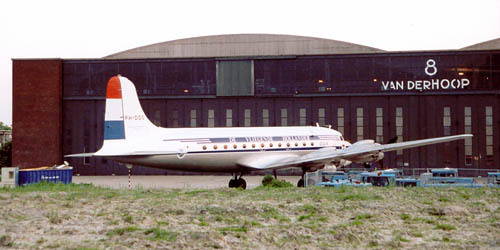 British Aerospace (Hawker Siddeley) HS.748-244 Srs.2 SE-LEG (c/n 1723) was photographed on 16Apr01. The HS.748 sold well in Africa, Asia and South America because of its uncomplicated characteristics and was able (is !) to perform well in all kinds of terrain and extremes of climate. The engines are 2 Rolls-Royce 2280hp Dart turboprops, giving it a speed of 452 km/h (281 mph) at 4570m (15.000ft) and a range of 3132 kms (1946 mls). While West Air Sweden has its homebase at Gothenborg-Saeve, its nice to see them base their aircraft thru Europe. Why ATP SE-LHZ has Luxembourg internet titles, I do not know. The photo was taken in Sep. 2002. The ATP is, of course, no improvement for me over the HS.748 ! West Air Sweden was originally founded in 1955 as LBF-Eda Varken, a privately owned air taxi operator. 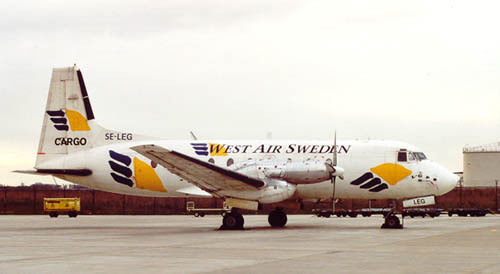 In 1982 the name was changed to Abai Air and in 1992 to West Air Sweden. By 2002 the fleet consisted of 10 HS.748s and 6 BAe ATPs. The BAe Advanced Turboprop or ATP is a twin turboprop airliner that entered commercial service in 1988. A total of 62 ATPs were built before the production ended in 1994. It has 2 Pratt and Whitney Canada PW126 or PW 126A engines, giving it a max. cruising speed of 266 knots (306mph, 493km/h) at 25.000ft and a range of 1740 kms (with max.payload). Take off field length would be 1351m. On Nov.03rd 2002 DC-4-1009 Skymaster ZS-AUA (former PH-DDS) was prepared for the crew of Springbok Flying Safaris, to fly it to Germany in preparation of its lease in South Africa. 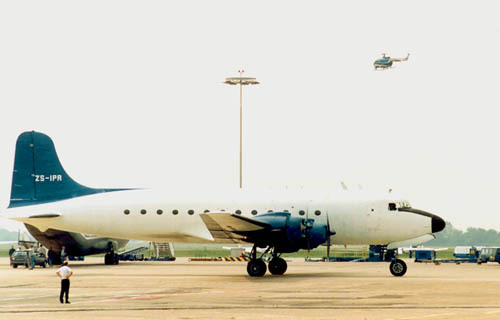 This Douglas DC-4 Skymaster was delivered to the South African Air Force on 17jan66 and received 6901 as a tailnumber. It entered the civil South African Register as ZS-AUA for Aero Air (Pty) Ltd and was reregistered as ZS-NUR on 17aug95. 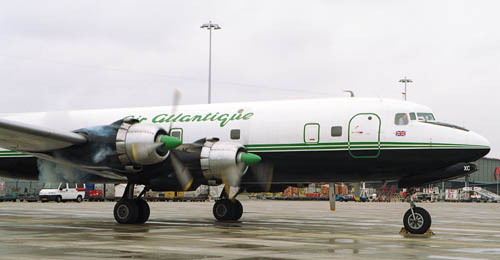 It was bought by the Dutch Dakota Association (DDA) of the Netherlands in 1995. It arrived at Amsterdam on 05may96 as ZS-NUR and I took this photo in 1996. ZS-NUR was reregistered as PH-DDS for the DDA on 17dec96. PH-DDS is seen here parked in front of hangar 8, a scene that could be from the 1960s, but was actually taken in the spring of 1998. The hangar was demolished in 2002, now they are both gone. Production of the Douglas DC-4 (military variant: C-54) ran from 1942 to 1947, 1084 C-54 Skymasters were built plus 79 civil DC-4s. Four Pratt & Whitney R-2000 Twin Wasp 14-cylinder radial engines gave this classic propliner a cruising speed of 365 km/h (227mph) at 4575m (15.000ft) and a range of 4025kms (2500mls). When the Springbok Flying Safaris tested the engines prior to the day of departure, they were more than pleased about the performance of the engines, reaching some 50 inches of manifold pressure ! This Douglas C-54A was delivered to the US Army Air Force as 42-107469 on 16may44. It found its way to South Africa and entered the Air Force with registration 6906. It was sold in 1995 to Aero Air as ZS-IPR. 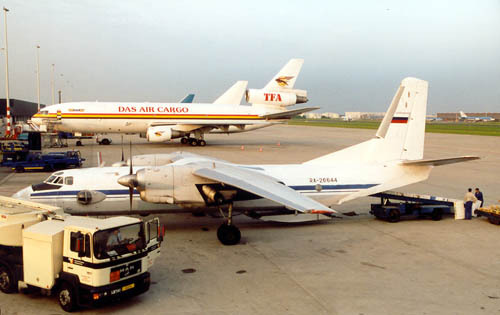 Intended to act as sparesupply for DDA's PH-DDS, it arrived at Schiphol on 04Jun97 as seen in this photograph. 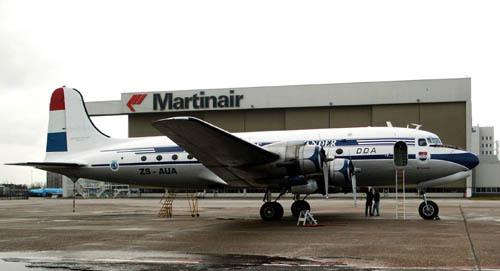 Only 2 airworthy older DC-4s were around at that time! It entered the Dutch Civil Register as PH-DDY on 09jun97 (type C-54A-5-DO). It was taken out the register on 19jan99 (no new BvL due to Nota Historische Luchtvaart). 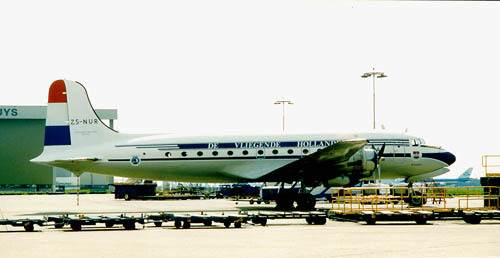 On DDA's Open House on 18apr99 it was reported as disassembled in hangar 2 (fuselage & wings). And when PH-DDS (ZS-AUA) left, PH-DDY was moved to Lelystad to be displayed in the new Aviodrome Air Museum in 2003. I can proudly say that I was instrumental in the visit of DC-6A/B G-SIXC (c/n 45550/1032) to Amsterdam Int'l Airport Schiphol: as I chartered it ! At work a situation arose that required the assistance of Air Atlantique (in my opinion !) and they flew a sparepart for a Martinair 757 from Prestwick to Amsterdam with the DC-6. The part was too large to fit in the lowerdeck holds of a scheduled airliner and trucking would take all weekend. Invented the callsign myself: "Martinair MP6666"! That Saturday Aug.24th 2002 was certainly a day I will remember ! I came across G-SIXC once more, on 18JUL2011 at Coventry's AirBase Museum: converted to a Diner! Check HERE..
UPDATE: The restaurant was not successful and closed during Oct.2017 (I have no exact date). 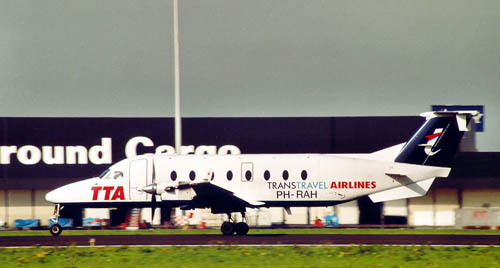 Trans Travel Airlines (TTA) brought the Beech 1900 to Schiphol. TTA was founded in 1985, but was bought by Rossair (in April 2001), which stems from South Africa. Beech launched the 1900 in 1982 (certification in 1983, first deliveries 1984) and few aircraft manufacturers have more experience in building twin props than Beechcraft, which was started by Walter Beech (born1891 and started his aviation career in 1914 when he and friend bought a damaged Curtiss biplane and repaired it.) in Wichita,Kansas. The 1900 'Airliner' is a 19-seat commuter and was developed in different variants. The 2 Pratt & Whitney Canada PT6A-67D turboprops give it a range of 2778 kms (1722 mls) at a cruising altitude 1525m (5.000 ft, (max ceiling 33.000ft). Beech 1900D "Airliner" PH-RAH (c/n UE-31) is leased by TTA from Rossair Europe BV, which in turn is a subsidiary of Rossair Holdings (Pty) Ltd. and was photographed on 12Oct01. KLM exel is a Dutch commuter, feeding passengers into the KLM hub at Amsterdam. ATR-42-320 PH-XLE (c/n 090) is seen here awaiting a busload of passengers on 02Feb02; they will board thru the aft door, while the door in front will see bags and mail stowed. 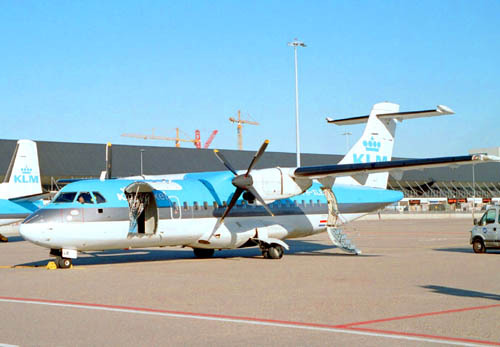 KLM exel, founded 26Apr91, is an independent Dutch regional airline, which has its headquarters at Maastricht Aachen Airport. In cooperation with KLM, flights are operated from Maastricht en Eindhoven to Amsterdam which performs as a hub. From MST and EIN flights have London (Heathrow and Stansted), Paris and Hamburg as destination. KLM exel flew till 30jan98 as Air Exel Commuter, a "d.b.a." (doing business as) of Air Exel Netherlands. To formalize the cooperation between KLM en Air Exel -dating from Air Exel's founding- repainting of all aircraft was started in Jan98 in KLM's regional brand colourscheme. KLM set up a feeder network from Germany in the late 1990s and from nowhere suddenly Eurowings, here in August 1998 with Aerospatiale ATR-42-300 D-BJJJ (c/n278), became a frequent visitor to Schiphol. But in 2000 KLM's share in Eurowings was sold to Lufthansa and in 2002 the KLM deal ended with Eurowings. 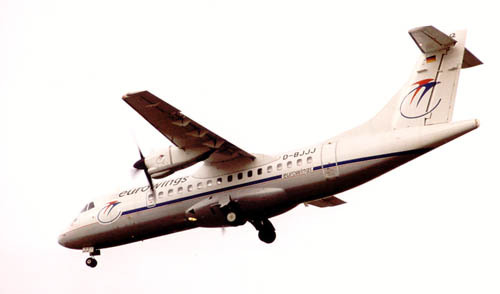 The ATR turbo-props are products of a cooperation between (French) Aérospatiale and (Italian) Alenia in the 40 to 70 seat turbo-prop aircraft catagory. The prototype flew in 1984 and next year certification was reached. The longer ATR.72 (=72 seats) first flew in 1988. The 2 Pratt & Whitney Canada PW120 turboprops are good for a cruising speed of 462 km/h (286 mph) and a range of 1946 kms (1207 mls). Another feeder for the KLM-network: Air Alps Aviation. I like the cat-like silhouette of the Fairchild Dornier Do-328 (here: Do-328-110 OE-LKC, c/n 3119) and prefer it over the ATRs and ATPs. The cooperation with KLM lasted only a short while and you can read on how it all started as Air Engiadina, changed to Air Alps and ceased operations as Swisswings in 2002. Fairchild Dornier came about in 1996 when US company Fairchild bought a large share of Dornier of Germany. In spite of the successful Do-328 and Do-328-JET, Fairchild-Dornier was declared bankrupt in 2002. The Pratt & Whitney PW119B turbo props deliver a cruising speed of 428 km/h (265 mph) over a range of 1852 kms (1148 mls). 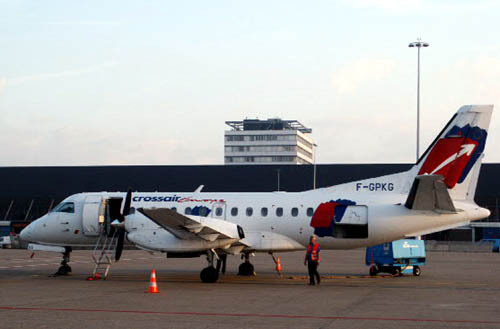 A Crossair visit to Amsterdam, with its Saab SF340 F-GPKG, here seen preparing for an evening departure (photo 2002). Saab had a considerable reputation in building military planes, but the last airliner was the Scandia of 1946. The Swedish company produced the SF340B, which made its first flight in 1983. It was aimed at the US market and orders came quickly rom American, Eastern, Northwest and Continental. The two General Electric (1870hp) CT7-9B turboprops give it a cruising speed of 522 km/h ( 325 mph) and a range of 1810 kms (1125 mls).